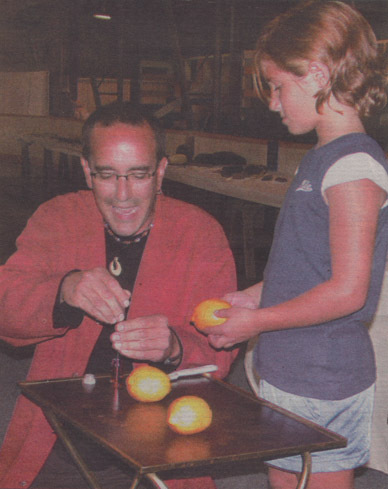 Using three lemons and some red dye made of boiled cabbage, science guru Pierre Harrison shows Rachel Bondi how to fool the audience in a variation of three-lemon Monte. there one-on-one and answer their questions." Mr. Harrison's workshops are tailored for a wide range of audiences, although he spends a fair bit of time in schools, he also has workshops for corporations and large companies. The art of observation he noted is the prime element involved in science, and learning to open your eyes and see things from a different perspective is important in any occupation. Judging from the fascination reflected in the eyes of many of the parents in the crowd, his message that science is fun may just have a universal appeal. Mr. Harrison can be contacted at pierre@playlearnthink.com.